This machine gives you a powerful, portable air compressor that is quiet and compact enough to operate in small work areas. The Silentaire Val-Air 300-100 AL Ultra-Quiet Compressor features automatic pressure settings during operation. Although it is almost completely silent while running, this top-quality air compressor is heavy-duty thanks to its 1/2 horsepower motor. The pump has aluminum heads and efficient cooling fins to prevent the unit from overheating during long periods of use. The machines are equipped with a tank with rust-proof paint lining its interior. Oil mist is removed by an in-line coalescing air intake filter while moisture is removed from inside the pressure regulator by a built-in moisture trap. 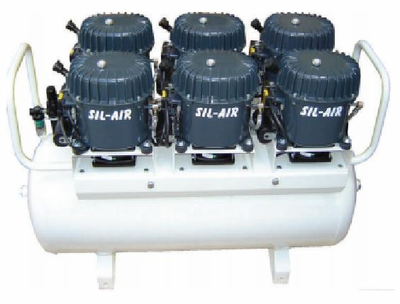 The air compressor also features both line and pressure gauges as well as a safety valve. The unit is easy to transport using its carrying handle and wheels. This model is available in either 220volt/60Hz or 220volt/50Hz. The shipping weight is 378 pounds with an oversize shipping charge of $105.95.